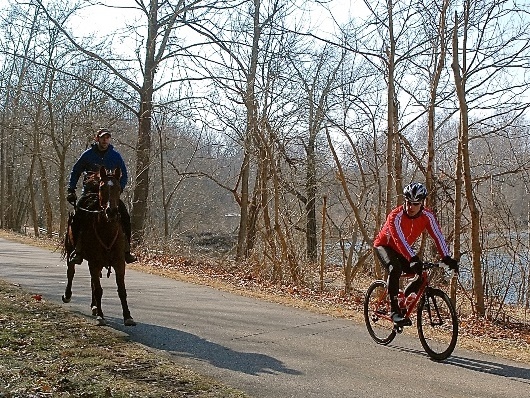 Prior to researching this article, I treated horseback riders I encountered on the Little Miami Scenic Trail as I do other trail users. With my newfound understanding of horses and their nature, I will adopt a more cautious approach. Here’s some advice from the experts. From end-to-end, the Little Miami Scenic Trail is a shared use trail. Trail users can engage in numerous activities including walking, hiking, birding, skating, roller skiing, running, bicycling and horseback riding. In the years before the trail formally came into being, horseback riders would often ride along the abandoned tracks that formed the right-of-way of the Little Miami Railroad. When that right-of-way was paved and as bicycle traffic on the resultant trail grew, many horseback riders chose to ride elsewhere, but those who remained took to riding in the narrow, grassy berms on either side of the trail. - When approaching a horseback rider (or riders), first, slow down. - Provide the rider with the time and space to take actions (e.g., moving to the side and turning the horse’s head away from the trail) as appropriate for her or his horse. - Wait for the rider’s verbal or non-verbal acknowledgement that it is safe to proceed. - Pass while providing the widest possible berth. For their part, horseback riders can support safe interactions by being alert for other trail users, being ready to take appropriate actions and clearly communicating intentions. Acclimating horses to the sights and sounds of the trail is helpful, as is riding with someone who knows the trail well. The beauty of the Little Miami Scenic Trail lies not only with the river, vegetation and wildlife, but also with the diversity of its uses. By exercising care when meeting all types of other trail users, you can do your part to be safe and to encourage full and varied use of our wonderful trail. The author would like to thank Art Koehler and Holly King for their valued inputs.